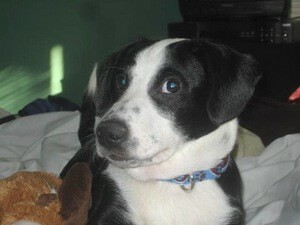 Wishbone will be 5 months old on April 16. Wishbone is a Border Collie I adopted on Feb 16, 2010 from the Humane Society of Kent County (Michigan). What doesn't he like to do? As noted at the Humane Society, he was labeled "class clown." He has proven himself to be just that. He does funny and unexpected things. He loves to retrieve a stick, or any toy that is available. He loves my grandchildren and the neighbor kids. He loves to go in the car and sit on one of my grandkids safety seats. He is so much fun and he's learning tricks. Wishbone is very special! He was meant to be with me. On Jan 2, 2010, I had to have my Cocker Spaniel, Cinder, euthanized. She was old and not doing well physically. It was one of the hardest things I've ever had to do. She was by my side for many years. I still miss her! I was encouraged to "just look" to see what was available at the shelter. Wishbone wasn't there that day but I did go back and when our eyes met, I knew he was the one. He has given me so much love and companionship. I'm glad we have each other. Oh! I can see a glint of humor in those eyes! Looks like you have a new "hand-full". Blessed life to both of you! Wow, I really like this dog! Look at the way he looks at the camera. it's like there is a little man inside there looking out. I am so glad you have another angel in your life after losing your beloved cocker spaniel.